The disease of the modern character is specialization. Looked at from the standpoint of the social system, the aim of specialization may seem desirable enough. The aim is to see that the responsibilities of government, law, medicine, engineering, agriculture, education, etc., are given into the hands of the most skilled, best prepared people. The difficulties do not appear until we look at specialization from the opposite standpoint–that of individual persons. We then begin to see the grotesquery–indeed, the impossibility–of an idea of community wholeness that divorces itself from any idea of personal wholeness. 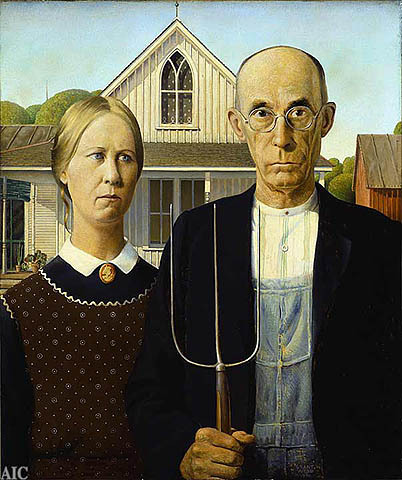 Berry points out Americans leave food production to agribusiness, instead of understanding that eating food is an agricultural act necessitating their participation rather than passive consumerism. This theme resounds with Sir Albert Howard’s An Agricultural Testament (a book I’ll soon discuss) and Michael Pollan’s In Defense of Food and Cooked. Berry calls for the consumer to return to personhood: “If a consumer begins to think and act in consideration of his responsibilities, then he vastly increases his capacities as a person.” If you look at a typical university, the problem maps itself out. Department of Architecture here, Department of English over there, Department of Philosophy nowhere near the two. Train in one of those, and you go further down the rabbit hole, until you emerge a specialist in a field that only a handful of people read in, but you have tenure and do not have to concern yourself with anything else but producing texts for specialists like yourself. Who are we to understand the labeling on food, to question monocultures, pesticides, the inequalities of food security? Leave it to specialists who when the going gets rough will call in more specialists. The following chart demonstrates part of the problem. 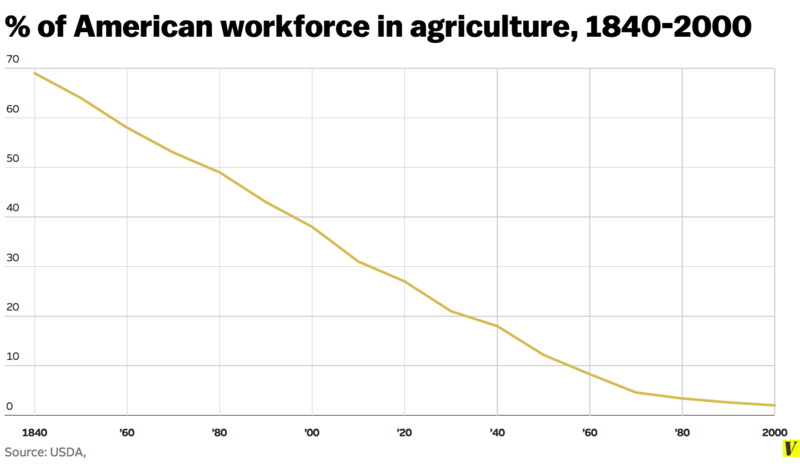 In 1840 agriculture accounts for seventy percent of the workforce, by 2000 only one percent of Americans work down on the farm. Combine this with Berry’s charting of the loss of small, family farms and you have our world where most of us have absolutely no part in putting food on our table, other than blindly buying it, setting it in the microwave, and waiting. The poet Allen Grossman in his poetic The Sighted Singer, addresses the necessary task of a poet to preserve what it means to be a person, to be human. He writes, “the use of poetry [is] for conserving the human image.” Grossman continues to define this project within a view of Western Civilization. When the poem ceased to conserve information about how to till the fields, about what flood-plains could be inhabited because they were free from cyclical dangers of inundation, when poetry ceased to be the principal instrument of conserving human laws (–it must be remembered that Solon wrote his laws in poetry, and that the Delphic oracle uttered its prophecies in poetic form, and that it was felt by most of Western civilization that the laws of Moses and the agonies of Job were embedded in poetic structures–) what was left for poetry was that fundamental function to which Horace refers: the function of making persons present to one another in that special sense in which they are acknowledgeable and therefore capable of love and mutual interest in one another’s safety. And what better way to show love and safety than taking care of what we eat; and taking care that what we eat makes us whole. Previous Previous post: Know Thy Eating. Next Next post: You Can’t Tuna Fish, But You Can Smoke It!